Happy Monday! How was your weekend? I was home a lot while the mister worked. Although, I was alone I enjoyed the down-time and even did a few DIY projects and ((sigh)) some cleaning. Late last week, I realized I never posted any camping photos. We went camping over 2 weeks ago and were unplugged* for 24 hours. 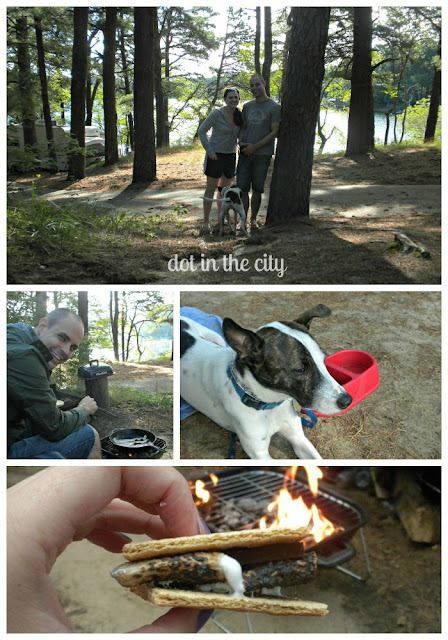 We drove just an hour to a state forest and spent one night ((since it was the dog's first time camping)) and we really didn't know how he would do. But he was great! Not a bark out of Milton until he met one of our camp neighbor dogs the next morning and was trying to coerce the dog into playing...ha :-) All in all, our Camp with Milton Mission was a success! Seriously, doesn't he look content? Once it got dark and it was time to go into the tent for the night, Milton really wasn't sure what to think. He was so hesitant to enter the tent, but eventually we got him inside. Once he realized we'd be with him the whole time, he settle right down while we played a game of Phase 10. I also documented some of our food and a little more of the campsite. And now you know a little bit more about my unhealthy eating habits while we camp ((confession: I ate that s'more before dinner, but told myself it was worth it since the photo turn out well)). Thankfully, the weather was perfect ((no rain)) and the camp site near a pond, which only added to the natural beauty. The drive coming and going to the state forest, was through a bunch of cranberry bogs. I had never seen a cranberry bog, so I was really excited about this part of the trip. They basically look like sunken in green fields. But there were several signs for Ocean Spray. Now, I'm scheming when we will visit/tour a cranberry bog! I can't wait for our next opportunity to go camping. I'm hoping we can sneak in another one before it gets too cold! Tell me, are you a fan of camping? I'm linking up with Molly for #YOLOMonday. * We turned off our cell phones while at the camp site and left them off for 24 hours. There was cell service, but we took the opportunity to enjoy nature fully, without the detraction of email, text message or any other updates. While, I appreciate technology and love connecting with others online, I found it so refreshing to take a break from it and not have to worry about the time or where I needed to be. I highly recommend turning off your phone and "unplugging" every once and a while! 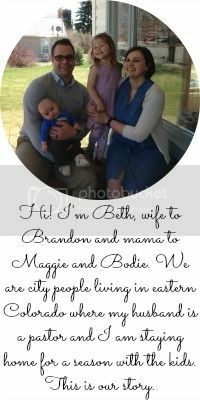 New Reader found you on the link up from #YOLOMondays :)Also see your part of the #shereadstruth group! How cool, me too! i love love love camping and getting the chance to fully unplug. sounds like y'all had a great time! thank you so much for linking up, beth. you are the BOMB, girl. awww, what a fun time! he does look content! and good for you for turning your cells off. it's hard at first, but then you forget all about it! and no one eats great when they're camping, that's how it's supposed to be! you're right...it's hard at first, but then feels great! Sounds like a great time! Glad you unplugged! Love that dog!!!! And cranberry bogs????? SO COOL! I can't wait for the weather to get cooler. I love camping and it's been way too long for my family. Great photos! we just went camping too!! and I LOVED the smores! !